Members will be pleased to know that, at long last, planning permission has been given by DNPA to South West Lakes Trust to repair and modify the Iron Store close to Burrator Lodge (application 0653/11), in order to make it available for school and other groups. 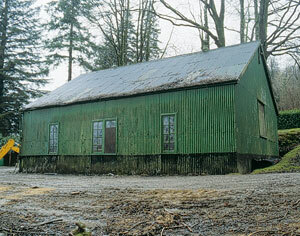 The Iron Store was constructed in 1901 and was used as the works base for management of the reservoir for nearly 100 years. It was South West Water’s and DNPA’s proposed destruction of this historic building and the development of its site as a car park, with associated commercialisation of Burrator Lodge, which was one of the key factors leading to the creation of the Dartmoor Society in 1998. In late 1998 DNPA declared the building to be of no interest ‘locally or nationally’. A member of Dartmoor National Park Authority even suggested it should be blown up with Semtex! A photograph of the Store appeared on the cover of Newsletter No.4 (February 1999), and it featured in an item in The Times newspaper of 9 December 1998. It was also discussed in an article in Dartmoor Magazine 54, Spring 1999, 20–21. So we’ve come a long way since then, and our consistent approach would appear to have been vindicated. Thank you for your letter dated 29 April 2012 addressed to Lorna Brown, sorry it has taken a while to respond. Seminar – I note your interest in the proposed seminar, this will be a chance to share the research and monitoring programme for the Project. As requested I will keep you informed of progress and we would welcome your attendance. Flat Tor Pan – we note your views on this but Lorna clearly spelt out our position in her letter of 12 April. Erosion – At this stage I have nothing further to add to the information previously supplied. It is the view of our own staff, experts in the field, Natural England, the Environment Agency and South West Water that parts of Dartmoor’s peatlands are eroding. The aims of the project are three fold; to restore blanket bog; to improve water quality and to protect carbon. As we have clearly spelt out in the past this is a pilot project, to consider feasibility and impact on the above three aims. The seminar may provide an opportunity for you to hear how this is progressing and speak to Dr Lunt and other specialists. Analytical Work – It is the view of experts, our own staff and project partners such as Environment Agency, Natural England and South West Water that natural colonisation of bare peat will not take place where there is running water and erosion. Through the project we are monitoring the effects of reducing running water on colonisation. Thank you for your continued interest in the project. I have tried to provide as much information as I can but there is very little to add given the amount of information provided in previous correspondence.